Organic crop farming aims to grow plants for food, decoration, medicine or other purposes without the use of pesticides and as sustainable and environment-friendly as possible. The main principles of organic agriculture are health, ecology, fairness and care. 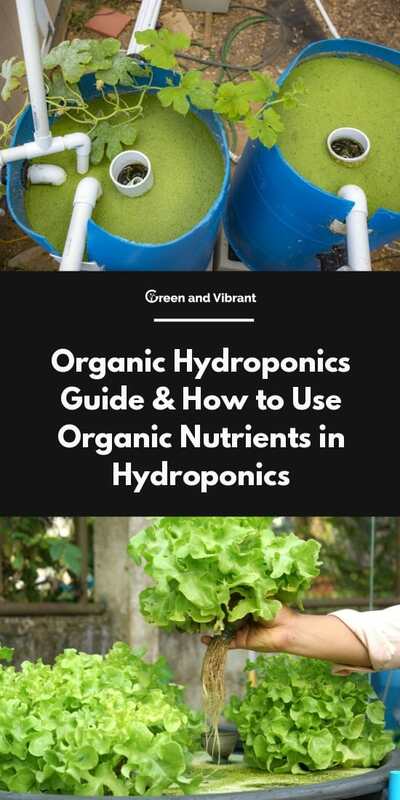 With its high rate of water saving, controlled growth which decreases the need for pesticides and fertilizers, and generally no heavy human labor, hydroponic growing systems have a great potential for going organic. However, there is one catch. Of all the mentioned main principles, the organic hydroponics debate falls into the ecology realm. In the worldwide definitions of organic production, soil health plays an important part of organic philosophy. Many things that conventional organic growers do are aimed at increasing the health of their soils, which, besides providing more nutrients for plant growth, has a positive influence on biodiversity. It even has an influence on climate change - soil which is dealt with according to the organic practices will sequester and keep in more carbon dioxide than the soil on conventional farms. Since hydroponics, aquaponics, and aeroponics utilize no soil whatsoever, they automatically breach one of the main rules of organic production, according to many organic farmers. On the other hand, hydroponic growers who have obtained organic certification in the US claim that hydroponic organic production still properly addresses the organic consumer’s main concern - hydroponic organics still provide food without synthetic pesticides. In 2017, USA’s National Organic Standards Board of the US Department of Agriculture - NOSB, voted that some hydroponic and aquaponic crops should get organic labels. Aeroponics crops didn’t get the approval. While the decision was welcomed by hydroponic producers and companies, it was met with a lot of hostility among soil growers. They quoted the English botanist Albert Howard, one of the organic agriculture pioneers, who wrote that "the health of soil, plant, animal and man is one and indivisible." At this point, it is uncertain if the decisions of NOSB will change in the future, or if a new labeling system, such as “Regenerative Agriculture” will evolve out of the current disagreements. In any case, these decisions will matter to you only if you have an ambition to become a certified organic producer. Still, most people that engage with hydroponics do it for hobby, pleasure, and to provide healthy produce for their family and friends. If you are one of them, then the final outcome of this debate will not really matter much to you. After all, if you lack a certificate, but want to sell off your excess produce, you can still participate in the green market and communicate your principles to the customers. While the soil of our planet is essential to its well-being, if you are a hydroponics or aquaponics enthusiast and still worry deeply about the influence of your hobby on the planet, know that hydroponics still has plenty of properties that make it good for the Earth, certified or not. Hydroponics saves water. Compared with the conventional agriculture, it uses only 1-2 percent of it! That is pretty impressive considering that water scarcity is becoming an increasing problem for both humans and the environment. Hydroponics utilizes spaces that would otherwise be unsuitable for food production. Your apartment, balcony, garage, warehouse, and many other soilless and ecologically “dead” spaces can be utilized to grow food, thereby reducing pressure on agricultural land. Organic hydroponics solutions made from scratch utilize organic waste that would otherwise end up in a landfill. Even the commercial organic solutions are by their nature more sustainable than the traditional chemical fertilizers. If you are doing aquaponics, you will also be raising fish, and there is a chance the fish is intended for human consumption. Global craving for proteins from meat and fish is the source of some of the worst environmental destruction on the planet. By producing fish protein sustainably in a closed system, you are reducing the pressure on the natural ecosystems. However, when it comes to sustainability, hydroponics has some. Here are some weak spots you need to be aware of. High energy consumption. Productive hydroponic systems utilize pumps and lighting that consume significant amounts of power since they are turned on most of the time. This issue can be addressed by using solar energy if possible. Since you are limited in the number of plant species you can grow, you can’t aim to create a real agricultural ecosystem which would help your local wildlife and biodiversity. The soil dilemma also falls within this category. Time & Effort. All the experimentation will take a lot of time from your hands, and some efforts can turn out to be futile. It is better to try to assess this from the start instead of having regrets once you’ve already deep into the project. Troubleshooting. If you happen to have trouble with your system, it is more difficult to trace what went wrong in a non-standardized practice. Fortunately, this is made easier by the fact that hydroponics enthusiasts have a strong online community, and there is a big chance someone with similar experience will manage to help you out in case something goes awry. Mess. People who like hydroponics for its cleanliness might not appreciate the mess that comes with experimenting with creating compost teas and other organic solutions. However, things are slightly neater in the case you are using a commercial organic base. There are many misconceptions about organic hydroponics. First of all, many people claim that this is impossible to do - that the system will stink, clog or simply won’t provide all the right nutrients that your plants need for proper growth and resistance to diseases. Many claim that successful hydroponics is impossible without synthetic fertilizers; that plants have a great chance to succumb to pathogenic fungi and bacteria which thrive on anaerobic decomposition of nutrients unavailable to plants. However, numerous examples of successful organic hydroponic systems have been documented. As a great example, check out this excellent documentary article by Keith Johnson for a detailed account of one organic grower’s success. You can read these at his Organic Hydroponics group. After all, we don’t have to look further than the popular practice of aquaponics to realize that hydroponic systems can use water with nitrates sourced from natural decay processes. There is one major difference in how you approach the plant nutrition within the organic hydroponic system. With conventional hydroponics, you basically just need to follow the already-provided instructions for different types of fertilizers, and monitor and test your water on a predetermined basis. Using organic solutions include more pre-meditation, more chemical monitoring, and inevitable trial-and-error experimentation until you realize what works best for you and your systems. A lot of people that fail with their first try at organic hydroponics is because they just replace their old chemical fertilizer with an organic one, even if their system is not compatible with organic hydroponics requirements. For example, in the video above, the author tried to do the simple replacement with little success. The issue is that plants can’t really use organic fertilizer she directly dissolved in the water. It needs to be pre-digested by the nitrifying bacteria. With its lack of growing medium and probably low oxygen levels, this deep water culture is inherently unsuitable for organic production. 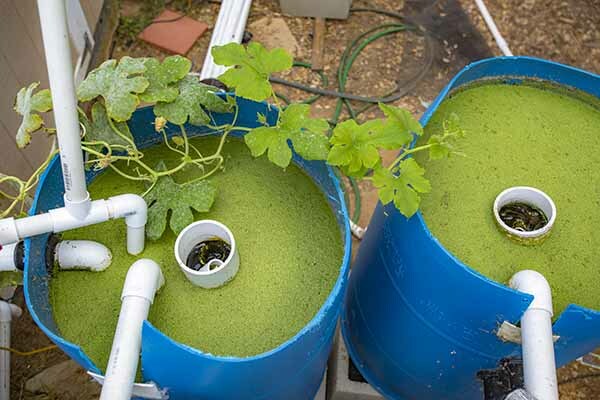 If you have an aquaponics system, you are already using a natural, organic nutrient solution - water enriched with fish waste and balanced out by the action of nitrifying bacteria. However, if your hydroponics system doesn’t include a fish tank, you can still create your own natural nutrient solutions by degrading other types of organic waste. Getting the nutrients right is the most critical point of organic hydroponics. Organic fertilizers probably won’t be able to provide a substantial ratio of all the needed minerals. However, some mineral salts, such as magnesium sulphate and other sulfate trace elements, are allowed in the organic production. 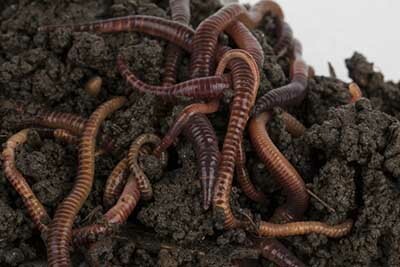 They can help you make up for the potential shortcomings of organic fertilizers. The biggest challenge is creating enough nitrogen and calcium available for your plants since they require large amounts of these compounds. This is why an organic base fertilizer, such as fish emulsion, mixed with organic liquid calcium product is a good start; organic nitrogen can be added later. 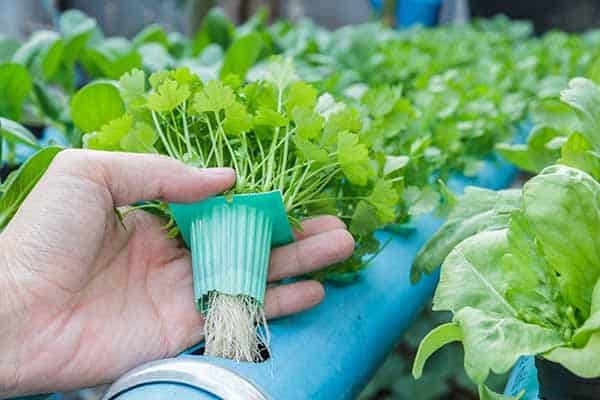 If you are striving to make your organic hydroponic garden even more sustainable and self-reliant, you can try to make your own nutrient solution from raw materials. The key aspect of this practice is to make organic (waste) materials avalable for your plants by pre-digesting them. This can be done either by using liquid bio-digesters, or even better, by utilizing vermiculture (worms) and creating worm tea out of the solid worm castings, or alternatively, out of compost. Keep in mind that the main issue with organic fertilizers is usually concentration. Too little, and your plants will be undernourished, resulting in stunted growth and deformities, as well as sensitivity to diseases. Too much, and your plants may suffocate and die because the nutrient build-up leads to oxygen depletion and pathogen proliferation. That is why every organic grower needs to learn all the early signs of undernourishment in plants, as well as the signals that you are using too much fertilizer. Note that the signals of an over-fed system should be detected (testing results, color, smell and texture of the solution, slime in the substrate, etc.) before it takes effect on plants. As a general rule of the thumb, use minimal quantities of your nutrient solution at first, until you see how the plants react. When you achieve a balance, as the system matures there will be fewer and fewer issues. The key for making nutrients available in either case is enough microbial activity around the plant’s root zone. Aerobic (oxygenated) digestion by bacteria is what makes the nutrients bioavailable to plants. It is the same principle that you may know from aquaponics. If there is not enough bacterial activity or enough oxygen around plants, a process of anaerobic degradation by different sorts of bacteria will take place, making the substrate smelly and a breeding ground for pathogenic microorganisms, all while failing to provide enough plant nutrition. Healthy aerobic bacterial activity is why you will need a hydroponic substrate which will provide enough surface for the microorganisms to thrive, as well as enough oxygen for their survival. Bio-filters provide all the bacteria need to thrive. Trace minerals are essential for plant growth, and in conventional agriculture, they have to be added to depleted soil to achieve healthy plant growth. Think about it for a second - what else is naturally rich in mineral salts? Of course, the sea solids - salt and other seawater evaporation residue. Many people have experimented with adding sea salt solutions to soils, and even with sea-based hydroponics. One of the enthusiasts that went the farthest is Dr. Maynard Murray. He had many allegedly successful experiments and even a commercial-scale project which included seawater-based hydroponics solutions. Dr. Murray even proposed a hypothesis by which modern human diseases occur because the soil (and the plants that grow on it) have become depleted of nutrients, and that seawater-based hydroponics is the answer for restoring humanity’s health. You can learn more about his work here. Whatever the final ruling on organic hydroponics may be in the next period, it is certain that hydroponics can be done in a sustainable way, the one that will be the best match to organic practices - only with the soil left out of the equation. Producing hydroponics without synthetic fertilizers and pesticides does take some additional work and experimentation. Fortunately, there are many good resources you can use, but ultimately you will have to discover yourself what works for your particular area, plants and type of organic fertilizer you are planning to use. It would be interesting to see what new discoveries would surface if every hydroponic grower tried his own experimental organic approach. Have you ever tried to do organic hydroponics? What was your experience? Please share in the comments. Let’s keep the conversation about this important topic going! Should Hydroponics and Aquaponics Be Considered Certified Organic?